Monrovia – Aggrieved residents of Louisiana Township in Lower Montserrado County are demanding justice in ongoing land disputes between them and one Blama Wright. The land is situated in the Fendall area. It is not the one, which is claimed by the University of Liberia. Over 100 inhabitants from Lower Fendall, Central Fendall, Caldwell, Sass Town and Samukai Town, among others gathered in in front of the Liberia National Police Central Headquarters in Monrovia on Monday, January 14, calling on the George Weah administration to intervene in the ongoing crisis to avoid alleged attacks on them by Wright. 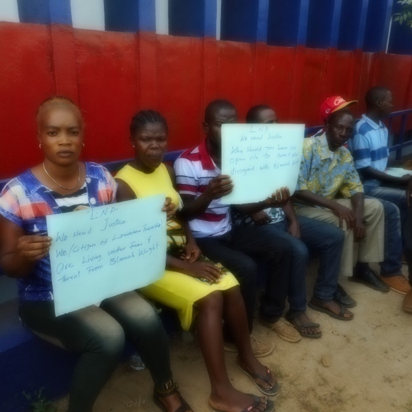 They at the same time, called for the release of one of their cohorts, who is currently in detention at the Monrovia Central Prison as a result of the same dispute. One of the aggrieved persons, Pastor Jeremiah Teh told FrontPageAfrica that Wright on December 24, 2018, came to their towns with some PSU officers, who allegedly meted brutality on five persons, while another six others were taken to prison. “Mr. Blama Wright came to our town on Christmas Eve and started calling some people robbers. He told the police officers to put some of our friends in jail. This is the reason why some of us rose to come and speak on behalf of the people in jail,” Teh stated. He further stated that Wright took them to court and that they have gone there more than five times and on all of those occasions, the complainer has not shown up. The Liberia National Police (LNP) on Monday, January 14, had a conference with the aggrieved party at its Headquarters. They, however, raised concern over the absence of Wright in the meeting. The LNP said it is still investigating the matter, but Pastor Teh regretted that the police didn’t specifically address their concern during the conference, but rather informed them of doing nothing until they can get to Wright. He repeated their demand for the release of their colleagues. Five of those in prison have already been released while only one is reportedly still behind bars. Another aggrieved occupant Lesonee Sheriff said the ongoing land disputes have left several of his peers in terrible conditions because of the alleged brutality meted against them. According to Sheriff, this latest situation has drawn the attention of Fendall Development Association (FDA), a group aimed at protecting lands belonging to neighbors in the Louisiana area. An alleged victim of the dispute, Arthur Z. Morris, said they took the complaint of those who were terrorizing them to the Civil Law Court but noted that the accused were released on bail. As he showed bruises on his body to journalists, he accused the officers who had gone with Wright of causing him bodily harm. “We met with the police today Monday, January 14, but they are telling us that they want to go at the site and establish facts first,” he said. Another aggrieved resident Musu Gbessay said she is frustrated over brutality meted against her husband. “On Christmas Eve, Blama Wright carried people on my husband Boima Gbessay and beat him. They broke one of his teeth. The PSU officers threw him in their pickup and took him to prison. He is currently at South Beach and have made three weeks there,” Madam Gbessay narrated. 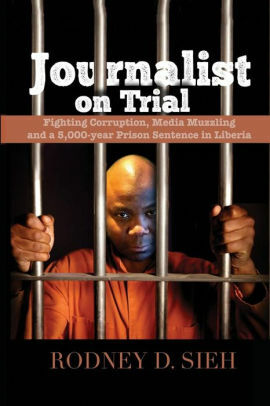 FrontPageAfrica was unable to get Mr. Wright until press time as reporter was told that he had been in a closed door discussion with the Liberia National Police.